"Modeled after a professional vineyard opener." When it comes to quality and value, this corkscrew from Barcelona-based brand Pulltap’s is a clear winner. Its design is minimal and sleek, featuring a nickel-plated double-hinged lever, a hinged serrated blade for cutting foil, and a retractable Teflon-coated spiral to ensure easy removal from both natural and synthetic corks. This corkscrew also has a reputation for being very durable, with several online reviewers reporting that they’ve had theirs for at least a few years, which often isn't the case with basic waiter-style corkscrews. Need some more help finding what you're looking for? See our guide to the best wine tools. Looks are deceiving with the Houdini—it’s a pretty serious workhorse despite how simple it looks and how affordable it is. Crafted from metal and plastic and measuring about 1 x 1.2 x 5 inches, it won't take up valuable real estate in your kitchen. You can even throw it in a picnic basket or purse if you plan on opening a bottle of wine outside! Its hinged fulcrum and retractable wire cutter make opening wine a total breeze, and there’s a built-in bottle opener, too. All in all, the Houdini Zippity 2-Step Corkscrew is a steal for the price. Although waiter corkscrews are simple to use, they do require some effort—but the OXO Steel Double Lever Waiters Corkscrew provides the extra leverage you need to get the job done smoothly. The OXO is made of stainless steel and has a comfortable non-slip grip—plus, a foil cutter folds out of the handle. From there, the non-stick screw slides into the cork, and getting it out is a cinch. 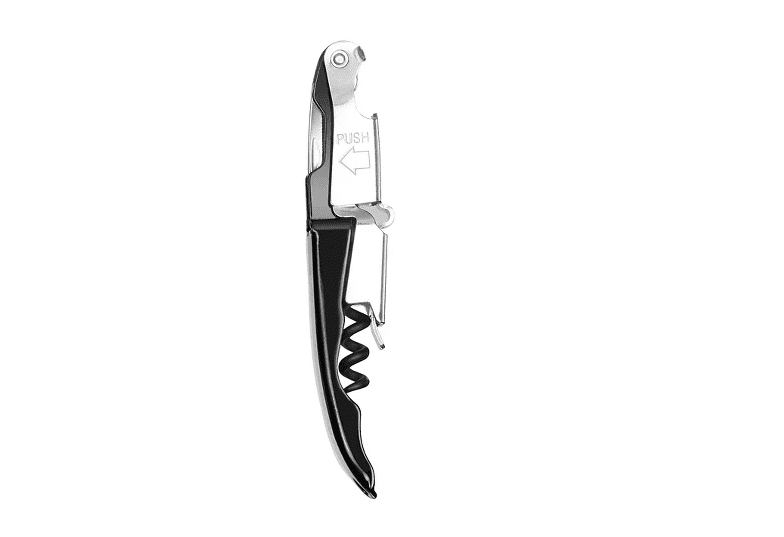 Online reviewers across the board report that the OXO Waiters Corkscrew is an excellent product. Interestingly, several have commented that the rounded edges of the corkscrew make it easier to operate than similar models. This also makes a great stocking stuffer for your resident wine enthusiast. For more ideas, read through our list of the best gifts for home bartenders. If you have an older bottle of wine on your hands and don’t want to risk damaging the cork, the Vintners Standing Wine Opener from Pottery Barn works wonderfully. This high-end model doesn’t come cheap, but you get what you pay for: it’s modeled after a professional vineyard opener, crafted with high-quality steel and finished in bronze. Best of all, the tabletop version actually holds your wine bottle securely in place for uncorking, which is why it works so well with aged corks. However, at 21 pounds, the Vintners Standing Wine Opener is hefty, so it’s ideal for those who’d prefer a sturdy contraption to keep on the kitchen counter as opposed to a lighter, more compact opener. If you struggle with arthritis or joint pain—or if you simply want to speed up the time it takes to get a glass of wine on the table—an electric wine opener can be a game-changer. This cutting-edge option from Secura removes any cork in seconds and even opens up to 30 bottles before you have to recharge the battery again. It’s elegant-looking, too, with a stainless steel exterior and a charging base with a bright blue LED light. The Secura has also amassed thousands of positive reviews online, with many users calling it the “perfect electric wine opener" because of its tasteful design and excellent foil cutter. Take a peek at some of the other best electric wine bottle openers you can buy. The Laguiole En Aubrac Waiters Corkscrew is easily one of the most deluxe openers available—if you want to impress your sommelier friends, this would be the corkscrew to buy. It's an investment piece, to be sure, but it’s handmade in France and features a folding corkscrew made of Sandvik stainless steel (known to be extremely durable and strong) and decorative chasing along its metal spine. Online reviewers praised the Laguiole En Aubrac for its impressive craftsmanship, with one person saying that it’s an “heirloom” piece. It’s perfect for the gourmet cook’s kitchen, or as a housewarming gift for a friend or family member. Plus, it comes in a beautiful storage box so all you need to do is wrap it! This sturdy lever-arm corkscrew from HiCoup Kitchenware will help you open your vino in record time. Both stylish and functional, this product is very simple to maneuver: you just place the corkscrew over the bottle, twist the handle to insert the polished helix worm into the cork, and push the wings down to extract it. Made from high-quality plastic and metal, the HiCoup opener is comfortable to grasp and easy to use, with online reviewers reporting that it requires just a very light touch to remove both natural and synthetic corks. Also, for added value, the corkscrew comes with a metal stopper, which one reviewer said was a “work of miniature art in itself." A lever-style corkscrew consists of two long handles that clamp around the mouth of a bottle and a single lever that drives the screw into the cork; it’s an easy-to-use tool since you don’t have to apply much pressure to operate it. Our pick for the best lever-style model is this option from OXO, which works equally well with natural and synthetic corks. Design-wise, it features a die-cast zinc handle, a removable foil cutter, and a non-stick screw. An extra screw is even included to increase the product's lifespan. Plenty of customers love this corkscrew, touting it as beautifully-designed, built to last, and, overall, "an astonishing device."